"Identity" exhibition at the Kaleidoscope Gallery in Sevenoaks. 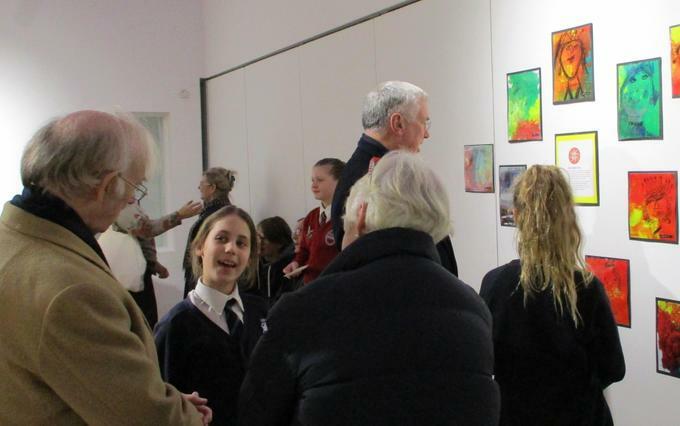 On 31st January we held a private viewing of our art exhibition ‘Identity’. The exhibition consists of art and sculptures by a selection of students in KS1 and KS2 led by our artist teacher, Miss Bird who is also exhibiting a selection of her own artwork alongside her students. The wonderful exhibits in a variety of mediums ranging from robots made out of old cans and scrap metal, to bespoke hats from a workshop led by ladies from the Mille Fleurs hat shop in Otford, and include an amazing animation created with help from Sue Bridge, an animator who has worked for the BBC. There are also dramatic Greek masks, colourful pastel drawings in the style of Frida Kahlo, delicate biro drawings inspired by the contemporary artist Mark Powell and of course Miss Bird’s incredibly detailed and evocative portraits. The evening was attended by Sir Michael Fallon, Councillor Simon Raikes and Mrs Christine Raikes, as well as students, teachers and families. The exhibition runs until 9th February so please do go and see our wonderfully creative children's artwork. For more photos please see the "Art at Otford" section of the website.